To say that I have become obsessed with making my own DIY cleaning supplies is a bit of an understatement. Each week I am trying out something new – hoping to come up with the perfect cleaner. It is not that I love cleaning – I just love the results. That said, over the years I have embraced the “good enough” method of house cleaning and household chores. Still, if there is a better way that happens to be better or cheaper, then this frugalista is all eyes and ears. So why is this important to preppers? It is important because post crisis (disaster, collapse or what have you), maintaining a clean and sanitized environment will be key in avoiding sickness. Not only that, but a clean environment will smell better and will have a calming effect on frazzled nerves. Today I would like to share with you the DIY cleaning supplies and gear that I believe should be in every prepper’s survival closet. These are the recipes that I use and the equipment that gets the job done. Almost everything can already be found in your home or can be purchased inexpensively. 4 BUT WHAT ABOUT ?? A word about these recipes. These are the concoctions that I am currently using. They are not the only ones that will work but to me, they are uncomplicated and do the job just fine with a minimum of ingredients. Make up a batch of Peppermint Magic in a repurposed juice jug. Fill your spray bottles from this master supply. Using different essential oils, you can make Tea Tree Juice, Lemon Juice or some other scent. I prefer peppermint oil or tea tree oil for their antibacterial and antiseptic qualities. This stuff is terrific. I have been using it everywhere around the house for the past two weeks and love it love it love it. It works well on my granite counters and it gets the greasy crud off my sinks. One of my favorite uses is to use my Sudsy Sal instead of running water to clean my dishes before putting them in the dishwasher. Okay, post disaster we won’t have a dishwasher but trust me, you will use a lot less water if you spray, swish, then rinse. This stuff even removed spots from my clothing. I am still discovering new ways to use my “Sudsy Sal” and am ranking this cleaner right on up there with my beloved vinegar. There are times when I want to go the extra mile to insure that germs are destroyed. While not as pleasant to use as Peppermint Juice (with vinegar) or Sudsy Sal (with Sal Suds), cleaning with alcohol is the surefire way to take care of the nasties. It also will brighten things up (such as granite countertops and stainless steel) by removing any left over film from other products. And to tell the truth, I think it is good to switch around from time to time. But that is just me. 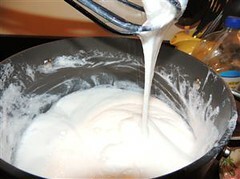 The instructions for making Dirt Cheap Soft Soap can be found in the article DIY Cleaning: Dirt Cheap Soft Soap. Since writing that article, I have also successfully diluted the homemade soft soap and used it as a body wash.
One other thing. The type of bar soap that you use may determine just how much you will need. Some bar soaps produce a very thick soft soap while others are a bit runny. The secret is to let your batch sit for 24 to 48 hours and add an extra spoon full of soap flakes or an extra bit of water after-the-fact if needed. Most of the time though, it will be fine just as it is. You will never purchase soft soap again. And by the way, the bars of soap you get in hotels when you travel work just great. Recently I have experimented with a DIY powdered laundry soap using a grated bar of Fels Naphtha soap plus the other dry ingredients. The results, however, were marginal. The investment in liquid dish soap is worth it in my opinion and is definitely a lot less expensive than using Dr. Bronner’s Castile Soaps in the laundry. For instructions on making your own batch of Better Than Good Laundry Soap, read The No Mess No Fuss Method of Making DIY Laundry Detergent. And as far as getting your laundry clean without a washing machine? 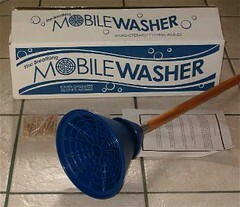 Try the mobile washer and a large bucket or even in a bathtub. It works well with just a modicum of brawn. Pour the baking soda and vinegar into the drain and let it sit for an hour with the stopper down. Remove the stopper and add a kettle of really hot water (or boiling water if you are careful) down the drain. If you do this every month of so, the drain will stay nice and clear. This works great in bathroom sinks where hair, makeup and other particles can quickly create pesky clogs. Empty the toilet bowl by turning off the water. Spray the bowl with Sudsy Sal then liberally sprinkle the bowl with baking soda. Let it sit for a few minutes then get out your scrubber sponge, and an old toothbrush and scrub away. Yes, you may need some elbow grease too but isn’t this a lot better than a toxic chemical cocktail? 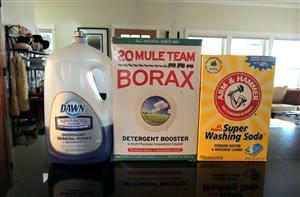 Now I am sure that many of you have a favorite DIY cleaner of cleaner recipe that I have not included. I even have a few additional recipes of my own that work just great but seem irrelevant in a post SHTF situation. Case in point: DIY furniture polish. I can clean my wood furniture quite nicely with Sudsy Sal but who the heck will care if my furniture is polished up nice and shiny following a SHTF event? Another example is citrus cleaner made from orange peels soaked in straight vinegar soaked. Yes, it smells nice but it is still just plain vinegar. It seems wasteful to me to use straight vinegar when you can heavily dilute it with water and get the same or better results. Besides, you have to wait two weeks. Who has the time for that? That said, if you have a tried and true DIY cleaning recipe, be sure to let me know. Being obsessed, I will probably give it a try. Old toothbrushes are the ultimate cleaning tool. They are perfect for getting into all of those nooks and crannies including under the rim of the toilet bowl. And the best thing is that they are 100% fee. The one thing that I do recommend that you purchase are some microfiber rags. Some of mine are over 14 years old and still go going strong albeit a bit stained. For a modest investment, you will give up using paper towels and old tee-shirts as rags forever. I like to color code: yellow for general cleaning and green for glass and windows. You don’t have to wait for a disaster to start making you own cleaning and laundry supplies. The money you save will be substantial – certainly enough to purchase something more useful that a toxic brew of chemicals pitched to you by Madison Avenue. I am convinced that once you start making your own cleaning products, you will never look back. Click Here To Vote For Me at Top Prepper Websites! Did you know you can vote daily? Bargain Bin: A lot of products were mentioned in today’s article. I won’t link to all of them but instead will highlight those that I have purchased online myself. Other items (such as the borax and washing soda) can also be purchased online (search Amazon) but may be considerably less money when purchased locally. NOW Foods Peppermint Oil : I favor peppermint essential oil (okay, I like lavender too) so this is what I get. But there are many types of essential oils to choose from. Take your pick. One thing you will find is that a little goes a long way. Mobile Washer: This is hand operated washing machine. Like a plunger, it uses a technique of pushing and pulling the water through clothes to clean them well without wearing them out. It uses a minimum of water and less soap due to the agitation motion. Use in a bucket (5-gallon suggested), sink or tub. The best part is that it is only $14.95. One really good special this month is their Do it Yourself SuperPail Combo kit for $69.99. 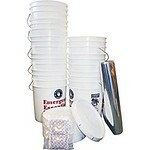 It includes 8 x 6-Gallon Buckets with Lids, 8 x Metallized Storage Bags and a 10-Pack of Large Oxygen Absorbers. 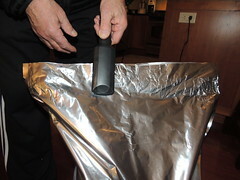 Don’t forget that you do not need fancy equipment to seal the metalized bag. A cheap hair iron will do the job. Conair Flat Iron 2″ Ceramic Straightener : I use a hair iron to seal my Mylar bags. Forget about a hose and a vacuum sealer. A $20 hair iron works great – just be sure to get one with 2” plates. Amazon has a cool new feature called Shop Amazon – Most Wished For Items. This is an easy tool for finding products that people are ‘wishing” for and in this way you know what the top products are. Like I said, very cool. Gaye what is the cost of the soft hand soap compared to buying soft soap in the store. I know you said it is less, but what are the savings? The 4.25 ounce bar of soap made up 1 1/2 cups of grated soap so with each batch I had some leftover for next time. Working the math though, I come up with .67 cents per cup of soap (assuming you paid a dollar), so the total cost for a full gallon using purchased soap was $1.47. Compare this to the cost of a one gallon jug of “Softsoap Moisturizing Hand Soap” at Costco for about $11. I use the dry laundry detergent and in a large old cat litter pail I dump and mix 3 boxes each of borax and washing soda, 1 cheap (dollar tree) container of oozy gem cleaner and 4 bars of grated fels naptha. I use 1 scoop (from the oxygen cleaner) per load and 2 if its a nasty load. 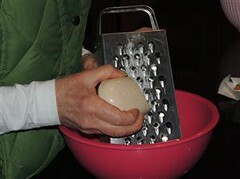 It helps to take the bar soap and slice it down the middle and make it thinner and set it somewhere it can air dry out. I buy the bars for the next batch when I make one so I always have them pre dried out. I wash everything in cold water and this detergent works great for us. A family of 6 with grubby lil munchkins and a hard working hubby. My all purpose cleaner for everything but glad is simply a tablespoon of liquid Castile soap in a 28 ox spray bottle and water. Add the soap last and shake gently. Dishes I am a blue dawn lover, it is the one cleaner I can’t find a suitable substitute for. Fabric and upholstery I use the Castile spray bottle on. Toilets I use a squirt of dawn in. Tubs either Dawn or baking soda. Nasty stove tops and ovens I use a sprinkle of cream of tartar powder. 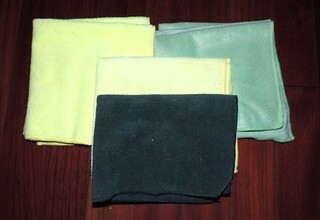 They make microfiber cloths with a metal scrubby side that is great for pots & pans even non stick. Sham wow type towels are a fantastic SHTF or even everyday and camping item. I keep a small one in every BOB. The Castile soap is great on kids too for bathing especially the baby mild. My son has a lot of skin sensitivities and eczema, none of these cleaners bother him and he bathes with the Castile soap. In our home we use Vinegar and Hydrogen Peroxide as our staple cleaning agents around the house. Hydrogen Peroxide (H2O2) has a wealth of medical uses in addition to cleaning. We buy food grade H2O2 at 30%, store it long term in the freezer and dilute it to 3% as required. Uses includes spraying on skin wounds, using it as a disinfectant around the bathroom/toilet, killing mold in the shower, via dropper applicator into the ear to kill germs, spray onto our wooden cutting board and kitchen sponges – especially after dealing with meat, spraying counter tops. On our kitchen cutting board or an infected skin wound it will bubble up whitish – no more bubbling means no more germs to kill. It can also be used to sanitize water suitable for drinking. Under careful management it can also be taken orally – I’ve actually practiced this over a 3 week course. The Internet, at least at present, still has some great info on this fantastic healer/cleaner. I am just starting to experiment myself with H2O2 so that I can write about it. I added a spray attachment to the bottle so that it is easy to use – especially on clothing stains. Some of the uses I have read on the internet, to me, have been less effective than tea tree oil. Others have been better. As always, I like to try things myself so I do appreciate your tips that come from first hand experience. Thanks for joining us and, of course, for the kind words!